America’s open warfare in the Middle East began with an attack on Afghanistan in 2001, in apparent retaliation after the 9-11 attack. The nation was led to believe that Osama bin Laden and his Sunni militant Islamist organization known as al-Qaeda plotted the attack in Kabul, Afghanistan. The attack stirred the nation to action. We behaved like a hive of angry hornets. The moment we thought we had a target, we swarmed off in support of President George W. Bush’s call to send military forces into Afghanistan to hunt down the al-Qaeda and take quick revenge. It turned out to be an irresponsible decision. It is easy now to look back on that time and perceive that the nation was tricked into going to war there, but not necessarily to fight terrorism. Al-Qaeda turned out to be an Islamic guerrilla force that claimed no national home. As our troops swept into Afghanistan, Bin Laden led his forces off into the mountains of nearby Pakistan where they disappeared. Yet we took command of Afghanistan, finding ourselves fighting the Taliban, the real militant Islamic organization that had its finger on the politics of that nation. Some said the Taliban was in league with al-Qaeda at that time so our troops chose to fight against the Taliban. As it turned out, the Taliban just wanted the United States troops to get out of Afghanistan, just as it wanted the Russian military to leave a decade earlier. Thus we appear to have been fighting the wrong people for the wrong reason. Next, in what turned out to be a nonsensical act without purpose, Mr. Bush and his administration went out of their way, lacing speeches and documents with lies and false information, to invade Iraq. We were told it was because Iraqi President Saddam Hussein was harboring “weapons of mass destruction” that could be a threat to the United States. Of course we now know that Hussein had no such weapons in his arsenal. So we now had been led into two Middle Eastern wars against the wrong people for the wrong reasons. What in hell was going on? Since taking office, President Barack Obama appeared to be keeping his promise to pull troops out of Iraq and Afghanistan. He did pull forces from Iraq only to find that we were leaving a broken and war-ravaged nation in our wake. And within weeks civil war broke out between the three Islamic factions that once co-existed there. Hussein was no longer in power to keep order. And now a new faction, the Islamic State, or ISIS has moved in. Thus our business in Iraq appears to remain unfinished after all. Also for some strange reason we seem to have a very hard time leaving Afghanistan. We are hearing all kinds of reasons why we can’t just pull out and bring our troops home, even though the Afghans have made it clear that we are not welcome. Would our inability to leave Afghanistan have anything to do with the fact that the country is the world’s major supplier of opium? While the opium poppy also is grown in Pakistan, Northern India, Thailand, Turkey, Laos, Burma, Mexico, Colombia and Hungary, Afghanistan has traditionally been the world’s largest producer of the drug. The narcotic heroin is produced from the plant, but so are a lot of important pain-killing pharmaceuticals including morphine, codeine, oxycodone and a variety of opiate-containing drugs that provide needed pain relief all over the world. 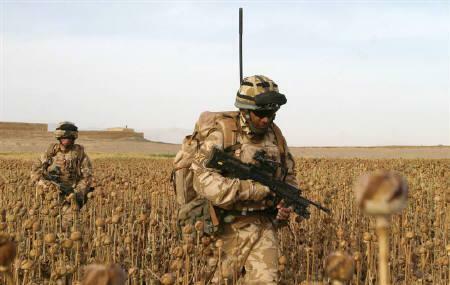 Thus the Afghanistan poppy flowers have remained an important and highly prized multi-billion dollar crop for both the pharmaceutical and organized crime industries. The war really appears to be all about big business. It had little to do with 9-11 or bringing democracy to Afghanistan. Granted this is a simplified version of a very complex situation that has been occurring in that part of the world. But we have to suspect that little poppy flower is the real reason we can’t bring American troops home from Afghanistan. We also might ask if this plant wasn’t a factor behind the attack that stirred America to invade Afghanistan in the first place.